Full line of compressor air filters specially designed to provide optimal flow rate and dirt holding capacity while maintaining the specified air quality demands of compressed air. Constructed of the finest quality components, including galvanized or plated metal components, phenolic resin impregnated, and pleated/synthetic media. Complete cross reference to all major compressor manufacturers. 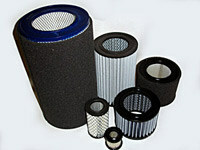 All replacement air filters meet or exceed the OEM brands quality, specifications and performance. Full line of compressor oil filters manufactured with both resin impregnated cellulose and high performance micro glass for superior dirt holding capacity. Filtering in 5-25 micron range. Increases the service life of downstream filters such as air-oil separators and fine filters. Complete cross reference to all major compressor manufacturers. 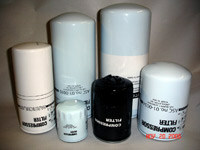 All replacement oil filters meet or exceed the OEM brands quality, specifications and performance. Full line of high quality, efficient separators designed for the removal of oils in air compressor systems. Typical efficiency of 1-3 ppm residual oil. Complete cross reference to all major compressor manufacturers. All replacement separators meet or exceed the OEM brands quality, specifications and performance. We supply replacement air, oil & air/oil separators elements for all brands including Atlas Copco, Busch, Champion, Compair, Curtis, Davey, Elliot, Gardner Denver, Ingersoll Rand, Joy, Kaeser, Kellogg, Leroi, Mattei, Quincy, Sullair, Worthington and many others.